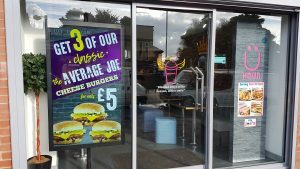 Mr Joes, Burgers and Shakes were looking for a way to entice customers from the street into their established takeaway restaurant. 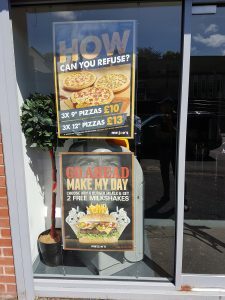 Mr Joes already had a successful website and social media policy to attract customers to the store, but the static window display were outdated and lacked visual appeal doing very little to attract passing hungry people. Syd, the owner, was looking for something with high impact, dynamic and ultimately eye-catching, that would attract passing motorists and pedestrians to come inside and make a purchase. After researching the internet for digital signage business, located in the local area, they contacted Dynamax. Dynamax recommended a high brightness 65″ portrait screen that would be street facing. This would replace the static, wire mounted advertising board currently installed, with a moving digital poster that was capable of displaying the mouth watering delights offered on the Mr Joes menu. The transformation has been amazing, from single static lifeless images to luscious eye popping video, displaying an array of temping foods. The display is controlled via Dynamax’s cloud-based, Core edition digital signage software, making the required changes to the display simple and manageable from anywhere. If you are looking for a digital signage install of you own, then please get in touch and we can help. This entry was posted in Digital Signage, Hospitality, Retail and tagged cloud based digital signage, digital signage advertising, digital signage for hospitality, digital signage software, retail digital signage by Dynamax. Bookmark the permalink.